While most traditional eGo style mods are very comfortable to carry and charge, they have one big limitation: low battery capacity. Once you start vaping regularly, the most commonly available eGo style mods will hardly last beyond a few hours of use. Yet, because of the ease in carrying and using them, a lot of vapers are very devoted towards this mods. Personally, I have to admit that despite their limitations, I prefer carrying them too (especially for outdoor use). So, if you are like me and can’t give up the convenience offered by eGo style mods, you probably need to get the one with the best capacity battery. This is where you might want to consider buying this eGo style battery. If you are thinking about getting a new eGo style battery, then this Vision Spinner 1300 review from VapingCheap is the right read for you. So let’s dig deeper into the review. 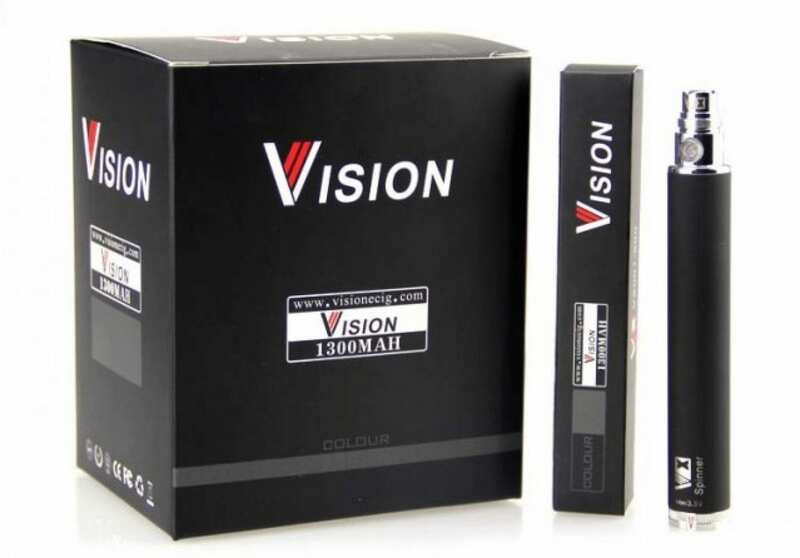 Vision Cig has firmly established itself as one of the best e-cig product manufacturers from China. With over five years of presence in the market, Vision has built quite a positive reputation among vaping enthusiasts. Since the company first launched its eGo style batteries in the Vision Spinner series in 2012 it has consistently been one of the best selling e-cig batteries across the world. Among the different capacity batteries produced by Vision Cig, this is the model with the highest power capacity with variable voltage options. I bought mine a few months back with the expectation that its comparatively high capacity battery would last me an entire day. I have to admit that I haven’t been disappointed with the product. Variable voltage batteries are in high demand lately, especially among users who want to customize their vaping volume. With variable voltage batteries, users can choose the exact amount that they feel the most comfortable with (in terms of both taste and vapor volume). In this regard, this one certainly stands out from the competition in many ways. You can choose between 3.3V to 4.8V voltages, by swiveling the rotating button at the top of the mods. You can also know the voltage level through a red indicator line that is carved on the button. However, you need to be keep in mind that higher voltages can also consume power quickly and drain the battery sooner in all VV mods. The Vision Spinner 1300 is undeniably a really strong battery. Despite its minimal 4.4 inches length, the performance of the battery is undeniably amazing. Most batteries with a similar power capacity are rarely smaller than 6’’. Because of this compact size, the Vision Spinner is absolutely comfortable to carry along in the pocket or the bag. You can also use it along with a lot of popular 510 threaded cartomizer and clearomizer sets on the market, like the KangerTech Protank. Like many common eGo style 510 threaded batteries, this one is turned on by multiple clicks (usually 5) on the LED start button. Users need to manually click on the LED button to produce the vapor in the cartomizer or clearomizer. After 10 seconds of clicking the battery automatically switches off until you click the button. However, unlike a lot of modern eGo style VV batteries, like the eGo Twist, there are no LED indicators to let users know that their battery is running out. So, without prior warning the battery can shut down after prolonged use. With a couple of Vision Spinner 1300 batteries, even the most avid vapers can go through the day without any problem. Even at the highest voltage a single mod will provide you 2-3 hours of uninterrupted vaping time. Depending upon who and where the vendor is, you will spend no more than $15-$30 on this battery. There aren’t many competitors in the market that can provide such a high capacity at such low cost range. With a shipping weight of only 2oz, the battery is incredibly lightweight and comfortable to carry. With a host of color options, beautiful rubbery finish and a slim 16.8mm diameter body, the Vision Spinner 1300mAh, is indeed a r﻿﻿eally well designed b﻿﻿attery. It’s also very easy to grip and hold even with small hands. With a 3-month warranty from the date of delivery, customers can easily get replacement for any defective battery from Vision Cigs. Besides that users can also benefit from the company's early buyback scheme, on recently bought batteries. While the battery is perfect for beginners or beginner-upgraders, this may not be as preferred by heavy vapers. At a maximum capacity of just under 4.8V, this may not be the product for vapers who prefer vaping at 5V or more. Many modern eGo twist style batteries, like the JoyTech Twist and Kanger IPOW2 have color indicators that indicate the battery level. However, I felt somewhat disappointed when I discovered that this feature was absent in the Vision Spinner 1300mAh. Depending upon the charger you use, the Vision Spinner takes around 3-7 hours to get fully charged. Despite the high battery capacity, some users will not like waiting so long to charge their batteries. Wrapping up this Vision Spinner 1300mAh review, I found it to be compact, comfortable and definitely has a strong reliable variable voltage battery. Despite its few shortcomings, it does offer a wonderful overall value in terms of price and quality. All in all, you won’t be disappointed by putting your money on this battery. Do you have questions or suggestions on this Vision Spinner VV 1300mah review? Do feel free to put your comments below. For more info, check out our other ​battery reviews.